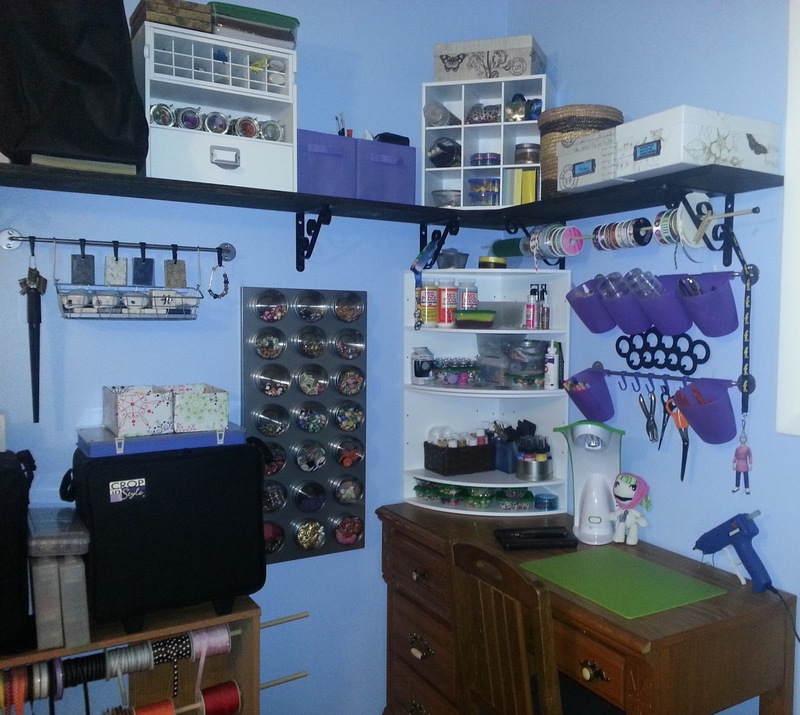 Check out part two of my craft room organization, featuring the rails, magnetic board, and beading storage! In June of 2012 we moved into our current home. Before that, my “craft room” was my bedroom–I had everything stacked into a corner and just pulled things onto the bed or over to my computer desk whenever I wanted to work on something. Moving into a much larger home that actually has a spare bedroom is still an amazing concept to me. This spare bedroom isn’t just for my crafts; we also use it for a workout room, and my husband stores most of his supplies (molds, dyes, and scents mostly) for making soaps here. What takes up the most space is the large, empty space we need to leave for working out! That meant that while I was organizing I needed to condense as many of my craft supplies as possible into one corner of the room. Eventually this became a matter of building up, not out. The desk I’ve owned since I was a teenager. It’s survived several moves now, though the chair had to be reupholstered a couple of years back. The shelving runs from the window casing on the right side of the above photo, all the way across the wall until it meets the closet, which is a ways off from the left-hand side of the photo. Those shelves are lumber that my husband cut to size and stained ebony, with scrollwork brackets from the Home Depot–looks great, doesn’t it? The four white furniture organizer units (the corner ones on the desk are two stacked) are part of the Recollection collection from Michaels. I did recently see that a couple of those pieces are being clearanced in my local store, so it’s possible that they’re phasing these out. 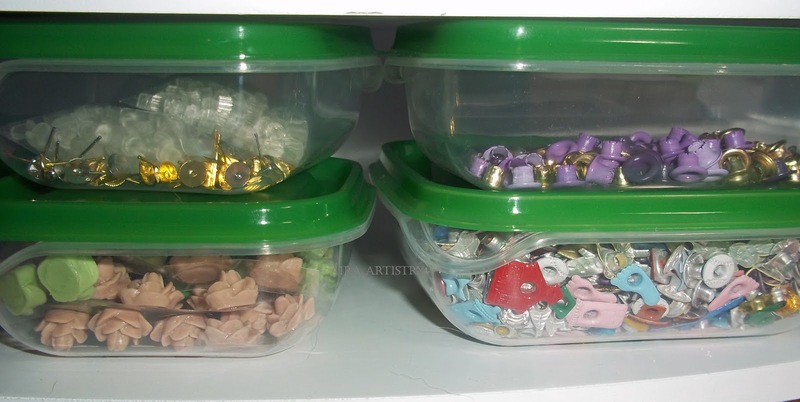 The Crop in Style container is a rolling bead holder that I got from Jo-Ann (x2… I waited until 50% off sales to get these, they’re pricey but awesome). 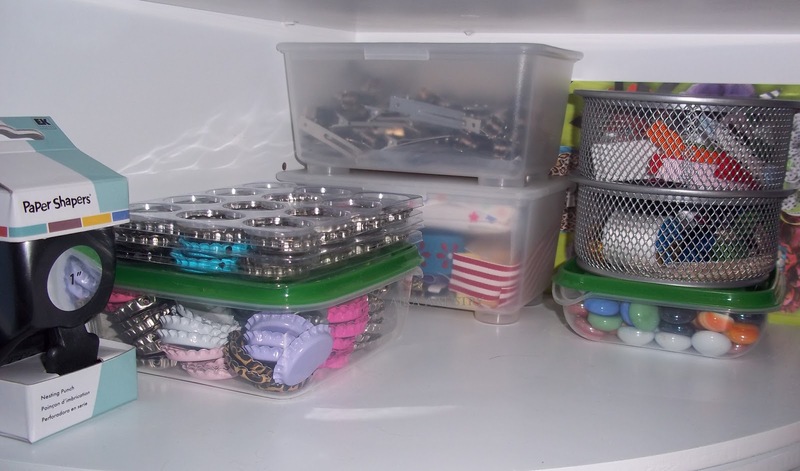 In-between my two rolling bead holders are a few smaller bead organizers from Michaels. Everything else I think I have close-up pictures of! I have so many that I’m going to break this up into at least a couple of posts. 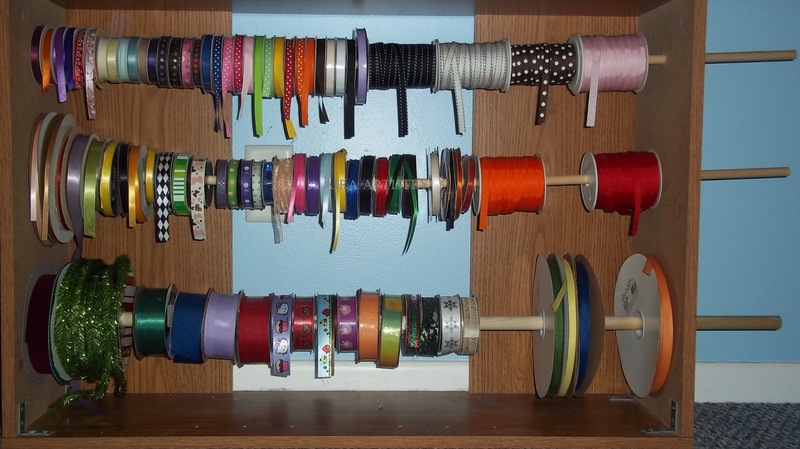 This ribbon holder is a DIY upcycle from my husband. It used be a cheap three-self bookcase from Target. We’ve had it for about 11+ years, since my oldest first owned it. Its most recent owner was my daughter, and the flimsy back on the shelf finally gave out. Never fear about her books losing a home–her bedroom in our new house has built-in wall shelving that I’m very jealous of! Basically what my husband did was reinforce the case with L-brackets, used the two shelves to reinforce the backside of the case, then drilled three holes into either side for the dowels. 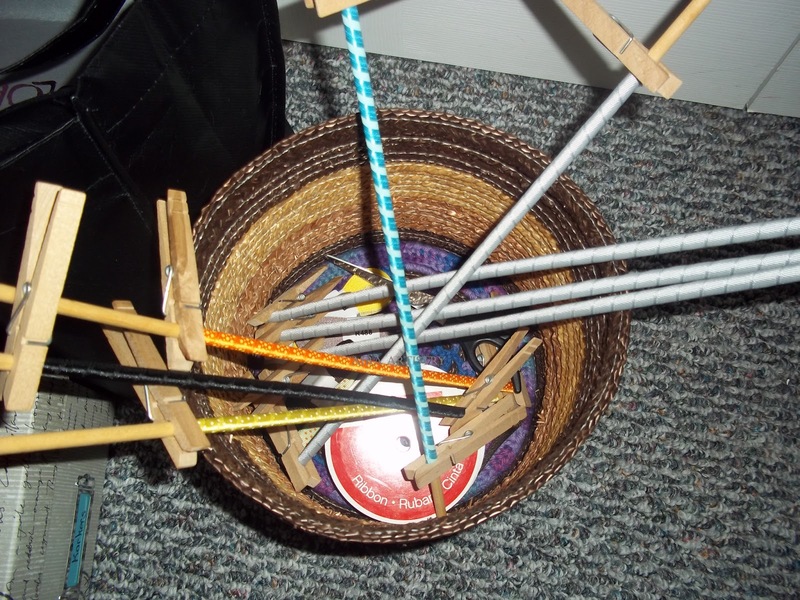 He got three wooden dowels (I believe they’re 1/2″ and 3/4″ thickness, we chose them based on what the ribbons would fit on without bowing it from weight) and glued a cap to the left side of the dowels. The dowels (that you see sticking out of the right side) can be slid to the left to allow me to add more ribbon on. Because I did decide to set my very heavy bead organizers on this case, the top started to bow, but the husband is taking care of that today by adding a cross-brace (and I moved the bead cases off for now). Pictured to the right are a couple of my DIY custom storage containers. 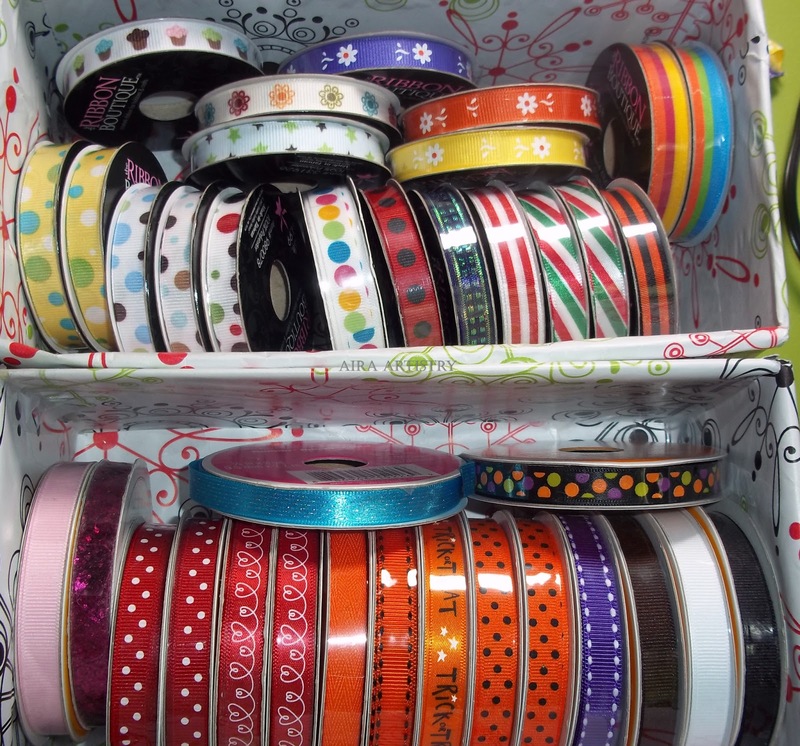 I went a bit crazy buying clearance and the new Halloween holiday ribbon at Michaels (bottom box), then took a trip downstate and visited a Hobby Lobby that had a 50% off ribbon sale (top box), so I needed some overflow storage. The upside is, I know I’ll be using all of this soon enough! 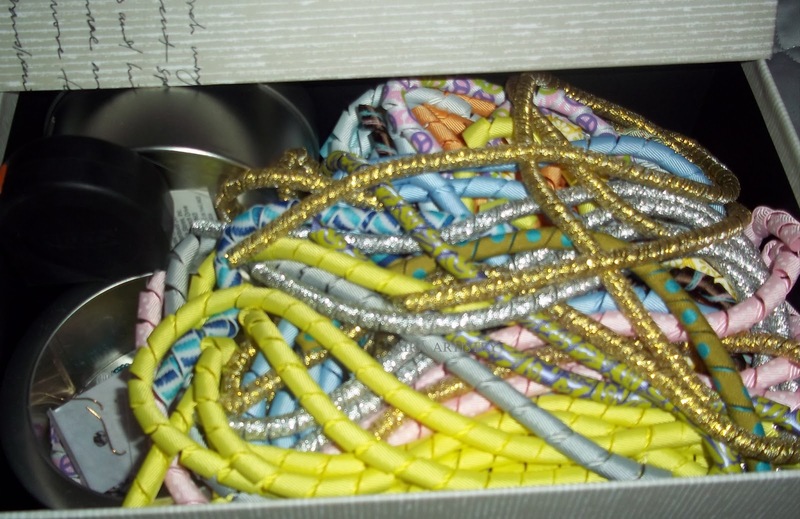 I’ve been making more korker ribbon as the temperature allows (I’m not going to use the oven in 90 degree heat!). On one of my recent trips to Michaels I found some large, nice looking Recollections photo boxes that were on sale for $2 each. I used a couple of them for photos (went from 7-8 photo albums down to using only half each of the two boxes, those things hold so much!) and the other three are for my craft room. One box that is not pictured here I designated for overflow items such as manuals or excess stock (like extra popsicle sticks I got when they were on clearance). The second box holds my korkers, including a couple of metal tins that I’m holding scrap korker and finished korker earrings in. 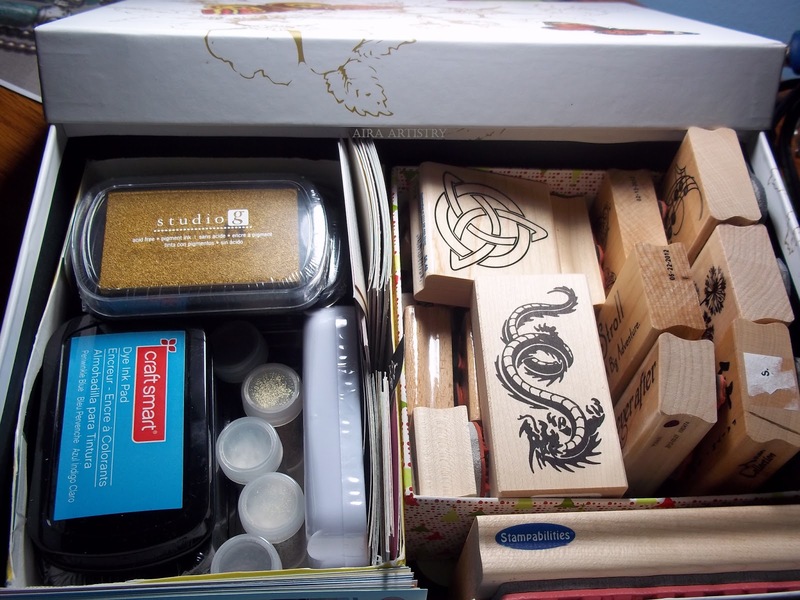 Finally, in my third box, are the stamps, ink, and embossing powder. Those are new additions for me that I haven’t used too much yet. For my korkers-in-the-making, I’ve been using a woven basket that my mother-in-law gave me. It’s the smallest in a set of three nesting baskets. One of the other things I’ve added are more clear storage containers. 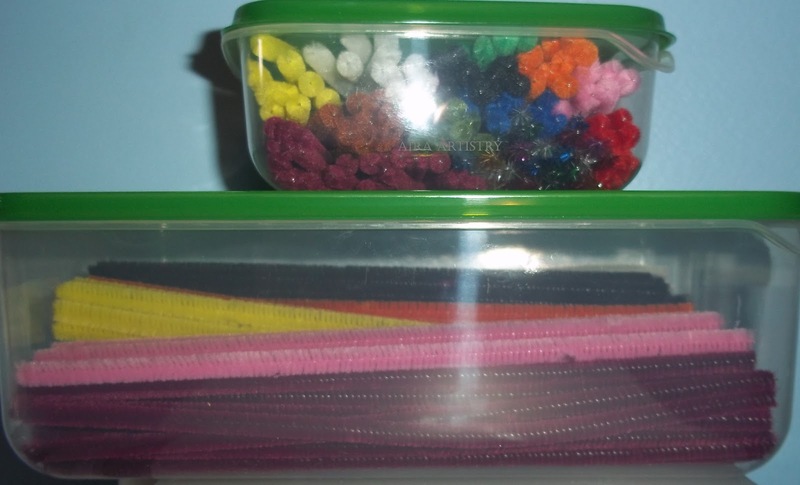 These are mainly IKEA’s Pruta food container set (you get 17 of these for $4.99) and the Glis boxes (three for $2.99–I bought three packs of these, gave my kids the tinted ones and kept the white ones). Being able to see at a glance where a lot of my things are is very helpful! Previous PostOne Month Remains to the EQ Next Unveiling! Next PostDragon Concept Art on Facebook!